There are many easy ways to add forms to your Weebly site. 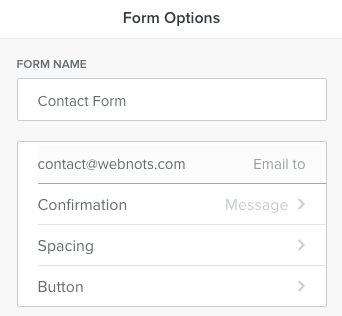 You can use default Weebly “Contact Form” element, connect forms from App Center and embed form codes from third parties. Being a native element, Weebly’s default “Contact Form” element is easy to integrate and manage the received form submissions easily through the dashboard or iPhone/ Android apps. In this article we will discuss the features of default “Contact Form” element and the ways to customize it. 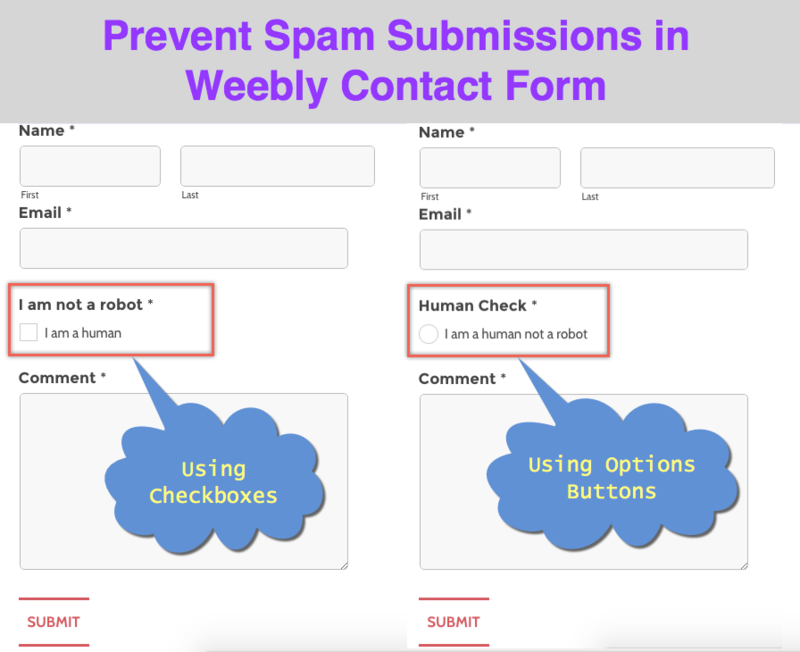 Other than contact form, Weebly also offers two other form elements – RSVP form and survey element. Like normal element each field can be dragged inside the form element. Clicking on the form element will show three options View entries, form options and save. Click the form options button to see advanced form options popup as shown in the picture below. Form name – Enter name for your form. When you use multiple forms in your site, the submissions can be viewed and identified based on the form name easily. Email submission to – This is an email id where you will receive an instant alert whenever there is form submission. Confirmation message after submission – The confirmation option allows you to display an automatic response to the user after submitting the form. You can either set a text confirmation message or link any webpage. The text message will be shown within the form area after submission. You can connect any external webpage or your own site or store page in the link option which will be displayed after submission. Spacing – Used to adjust the spacing of top and bottom margins of the form element. Submit Button – Used to align the submit button left, center or right with respect to your form width. Also you can enter any free text like “Contact” instead of submit on the button element. General practice is to create a thank you page in your site with the customized information you want to show to the users and link it to the form. Thank you page will be displayed once user submits the form and provide more opportunity for the user to explore the links in the thank you page. 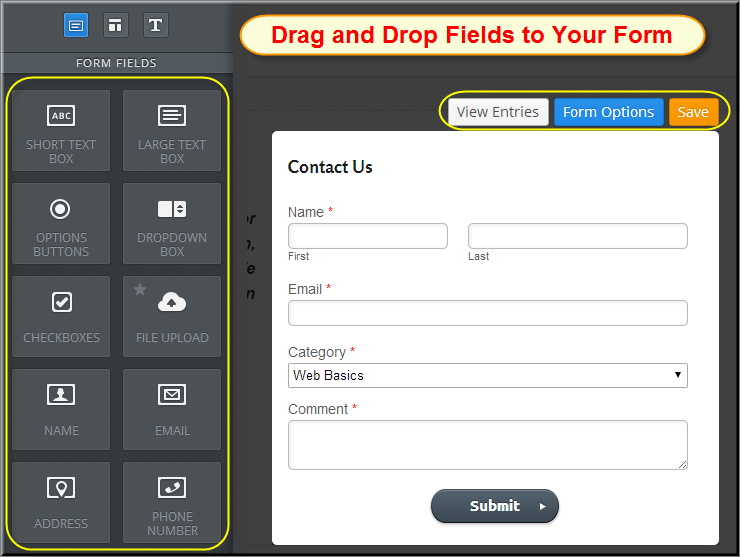 Clicking inside any of the form field will show a popup box applicable for that field. You can change the field name, make it optional or required, add instructions for filling and adjust the spacing of the field within the form. Making a required field will show a star mark on top of the field name indicating the user that is a mandatory field. 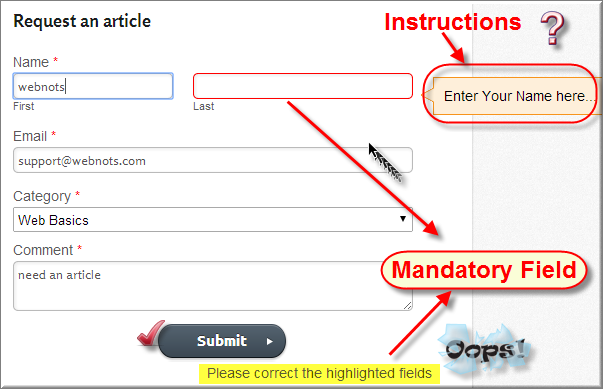 Failing to fill the mandatory fields will not allow the form to be submitted and display a message “Please correct the highlighted fields” and the field will be highlighted in red color. Instructions will help the users on how to fill that particular field and the help message will be displayed whenever the filed is focused. Some of the fields like “Options Buttons”, “Checkboxes” and “Dropdown Box” will have additional options as shown in the picture below. You can enter as many as customized options for user selection or choose it from the predefined options list. The predefined options have long list of choices like Comparison, Gender, U.S States, How Long, How Often, Months of the Year, Days of the Week, etc. 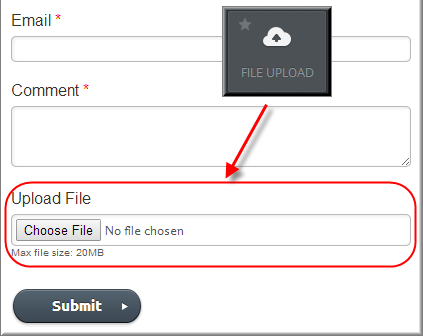 File upload – This is a pro field which helps the user to submit a form with an uploaded file. This will be a very useful feature so that the user can upload additional document or screenshot which will in turn help you to provide a better support. 20 MB is the maximum file size that can be uploaded in a form. Adding Form in Footer – In addition to adding form in site’s content area, Pro users can add a form in the footer area as well. Contact form can be added in the footer which will be displayed in the all the pages of a site. Form entries can be viewed in multiple ways and the required response can be sent to the submitter accordingly. Click on the form to see “View Entries” button, clicking on which will open a new window with all form submissions. You will also receive an email alert whenever there is a form submission. View the form submissions right from the dashboard. You can also use Weebly iPhone or Android app to view and reply your form entries on the go. Size of the Weebly form can’t be adjusted by default. In order to change the size, place the “Spacer” elements beside form element and adjust the width of the form. Add “Checkboxes” on the contact form and make it a required field. You can make the “Field Title” as “I am not a robot” and add one “Options Items” as “I am a human”. This will force users to check the box and the form can’t be submitted without checking it. Similarly use “Option Buttons” and change the “Field Title” to anything like “CAPTCHA Check” or “Human Check” and make it a required field. Add single option item like “I am a human not a robot” or any text you want. Now the user needs to use choose the option in order to submit the contact form. In both the above options, the automatic bots will fail to choose the checkbox or the option button thus stopping the spam entries. Many users emailed us and asked for the way to change the background color of the Weebly contact form and here is how to do that. Each contact form will have a form #id after publishing the site. Right click on the contact form on a published site and click on the “Inspect” or “Inspect Element” option and find out the form #id number for your contact form as shown in the below picture. The form #id will be something like “form-1234567890123” and will be unique for each form. Now go to Weebly editor and add the below CSS code under “Header Code” section of the page on which you have a contact form. Don’t forget to replace the form #id with your own #id. If you have more than one forms either you can customize them with different background colors or add all form #IDs like #ID1, ID2 and have the same styles for all the forms. If you have more forms then add the CSS under “Settings > SEO > Header Code” section or under “main_style.css” file. I really need a unique identifier element to add to my basic contact form so my email client will sort responses individually, instead of grouping them together by date. The default grouping action is a real detriment to ensuring timely, accurate response to our contact form. I really need a calendar “drop down” so that people select a date that is verifiable. Is this a possibility? By default no. You may need to look for third party forms with that option, probably a paid one. Is there any way to change the color of the font that appears when people are typing in their information? I would like to change the color of their font from black to white. I would like to have headings and drop down boxes with selections that would link my clients to particular pages. Has anyone figured out a good way to get data off of the in-app form data page and into Excel? If you refer downloading the form submissions to excel then you can do it right from the dashboard. Check out the section “Exporting Contact Form Emails” in article https://www.webnots.com/5-things-you-can-do-with-weebly-dashboard/. How do I make checkboxes/multiple choices? Drag checkboxes / options buttons element to your form. Can I customize the thank you page sent after a form is submitted? Yes, create a custom thank you page like a regular page. On the contact page choose the confirmation option as a link and provide the link of your thank you page. This is the answer I needed thank you! The article is updated for customizing background color. How do you customize the color of the entry field (not the entire contact form) just the field you actually type information into?